Yokaichi Giant Kite Festival is held every Mey in Higashiomi, Shiga, Japan. 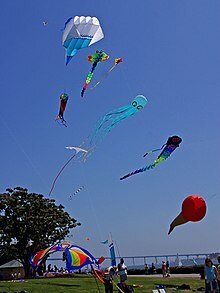 A kite is an aircraft consistin o multiple wings tethered tae an anchor seestem. ↑ "Beginner's Guide to Aeronautics". NASA. Retrieved 2012-10-03. This page wis last eeditit on 19 Mairch 2018, at 06:46.